Petulant Bertha and Her Well-Behaved Sisters! 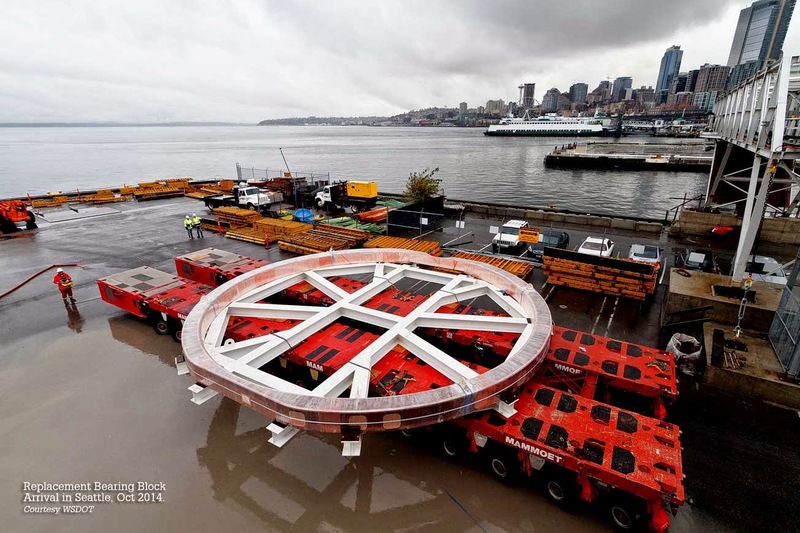 Into Daylight Saving Time, welders working through the night, attaching lifting rings to components of Bertha, the besmirched Tunnel Boring Machine (TBM), stuck for more than a year beneath the Streets of Seattle. 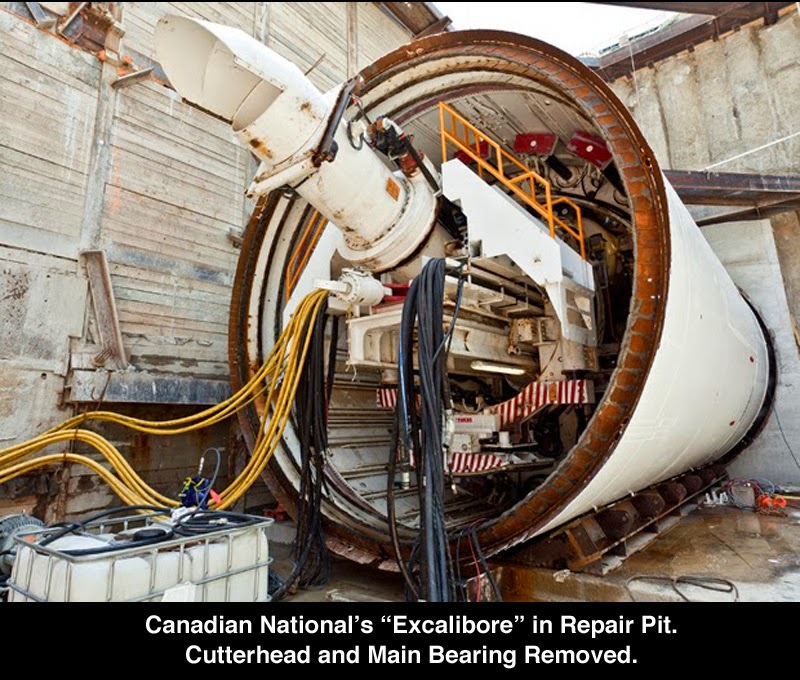 “Excalibore” suffered major seal damage, which resulted in a nine month delay in tunnel completion. 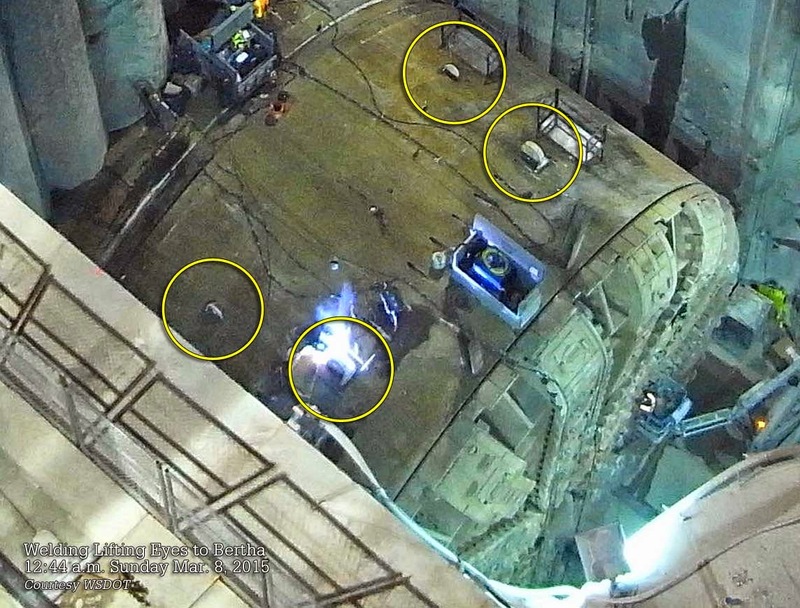 Bertha just completed boring into the rescue pit, where a gaggle of workers will dismantle the Cutterhead, returning it to the surface for repairs. And so far, she is more than 18 months behind schedule. The original Timeline projection for completion of boring reflected September 2014. 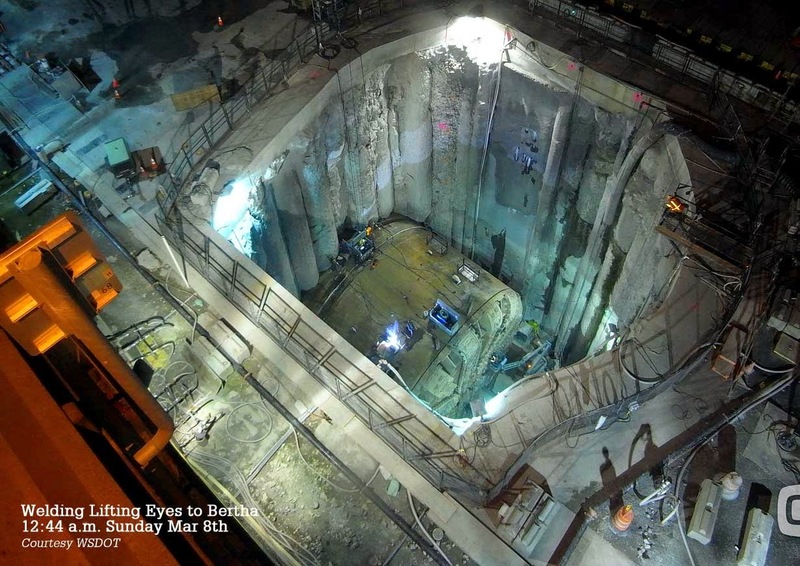 Work began on Friday to attach lifting eyes to Bertha for extracting the machine from the rescue pit. I’ve compiled a series of YouTube clips, that bring us up to date. Remember to click on the "maximize" button to view the YouTube video in full screen. 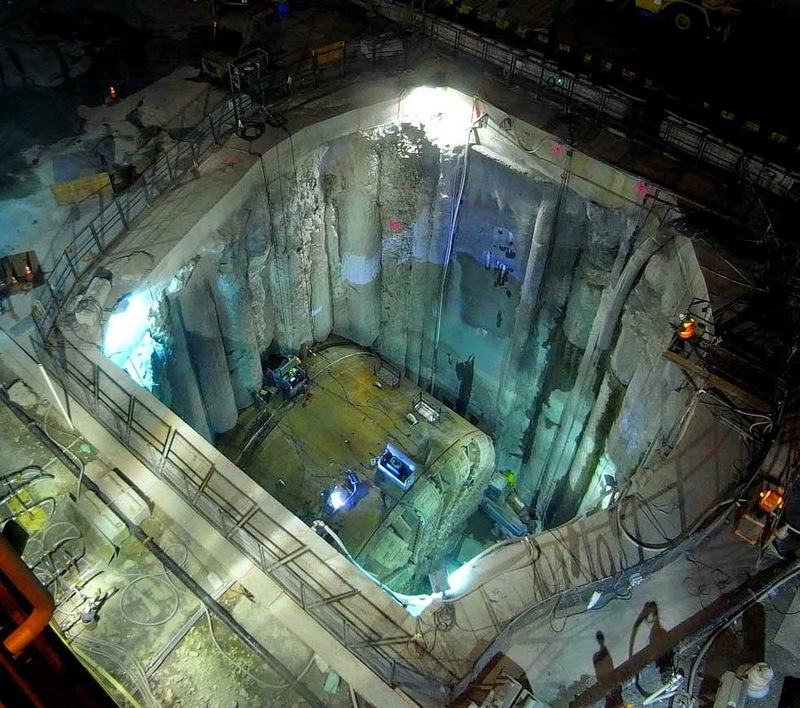 • Bertha Tunnels Toward Repairs. 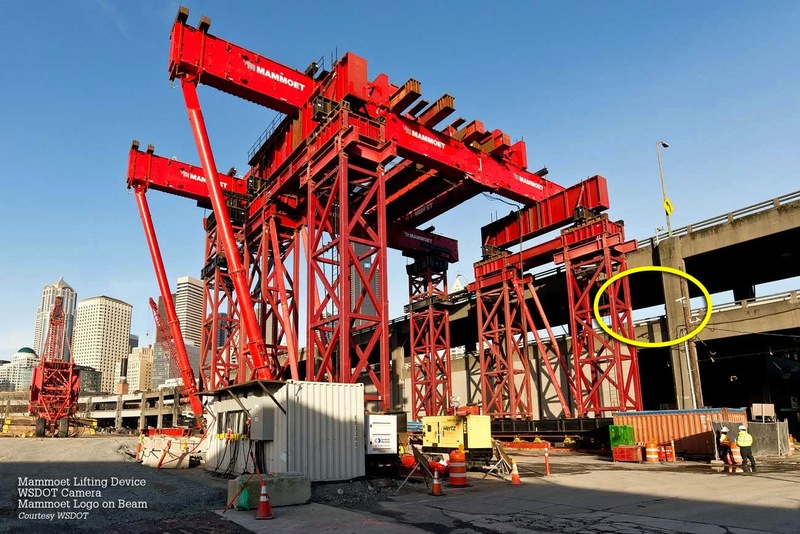 As Bertha’s Cutterhead chews through the concrete piling of the rescue pit, spoils are shuttled by conveyor belts the length of the tunnel, across former Alaskan Way to Pier 47. Here the spoils are loaded onto a barge, to be delivered by Foss Maritime, for disposal in a former borrow pit located at Mats Mats Bay. 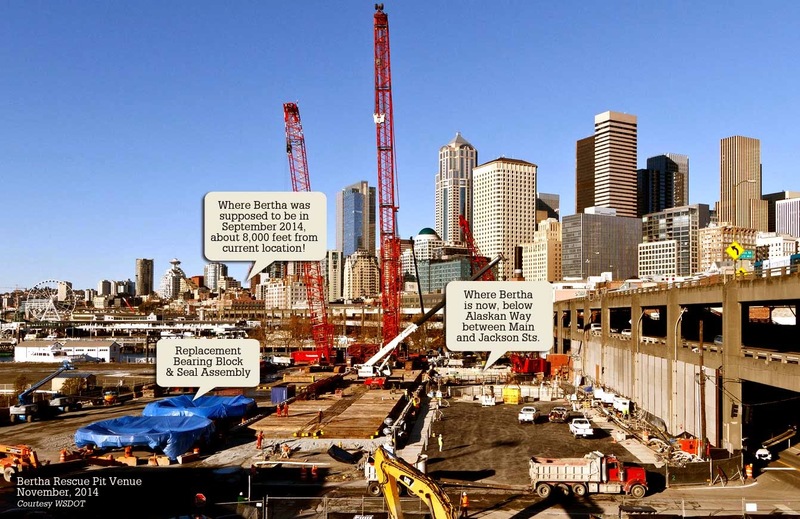 • Bertha Reaches Daylight, February 19, 2015. A final exciting moment as Bertha gnaws into the rescue pit. In preparation for the break through, a hydraulic pick chiseled out a notch to create a clean entrance into the pit. One is struck by the slow speed of the Cutterhead! Remember, it stands ~5 stories high and weighs ~900 tons, driven by 24 dc motors! • Chris Dixon, spokesman for Seattle Tunnel Partners, explains the process of retrieving and repairing Bertha. • Building a Super Crane. As we’ve just witnessed in the animation clip, a large lifting device will be used to disassemble Bertha’s business end, laying the various segments out for repair. Such devices are “purpose built” for the job at hand. This Mammoet crane has a lifting capacity of 2,200 tons. You may recall the Cutterhead weighs in at nearly 900 tons. I’ve circled the WSDOT camera that gives us this view of the lifting device. The “Mammoet” logo was not added until the crane had been in place for a few days. I was unable to capture the individual applying the logo to the frame! In preparing for the upcoming repairs, a brand new seal assembly was manufactured in Japan and shipped to Seattle last fall. 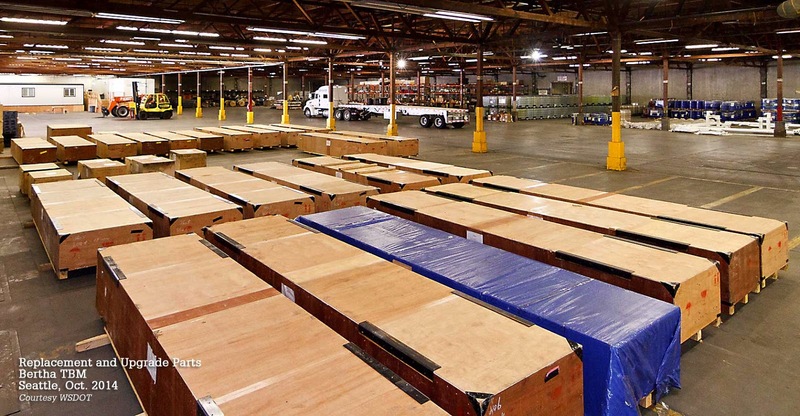 In addition, boxes of parts and upgrades to TBM components have been stored in a nearby warehouse. 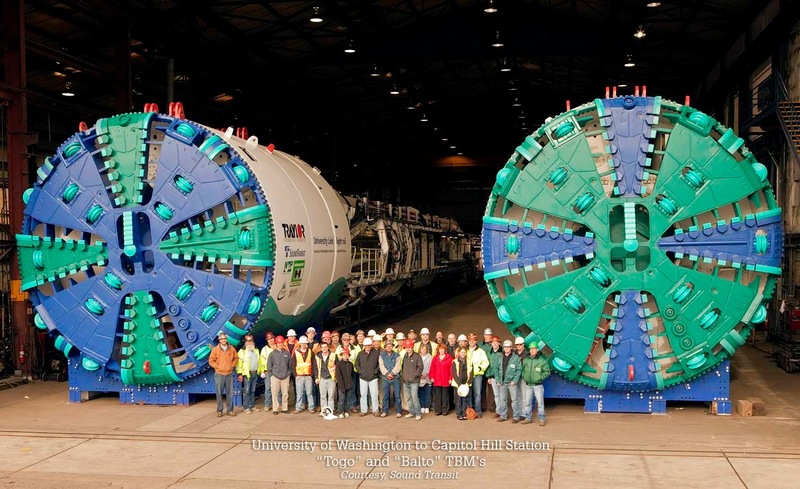 While Bertha has been displaying her temper tantrum, Seattle's Sound Transit TBM's have been busy in the North End of Seattle, burrowing rapid transit tunnels, including a dig beneath the Lake Washington Ship Canal, with a striking absence of headlines! 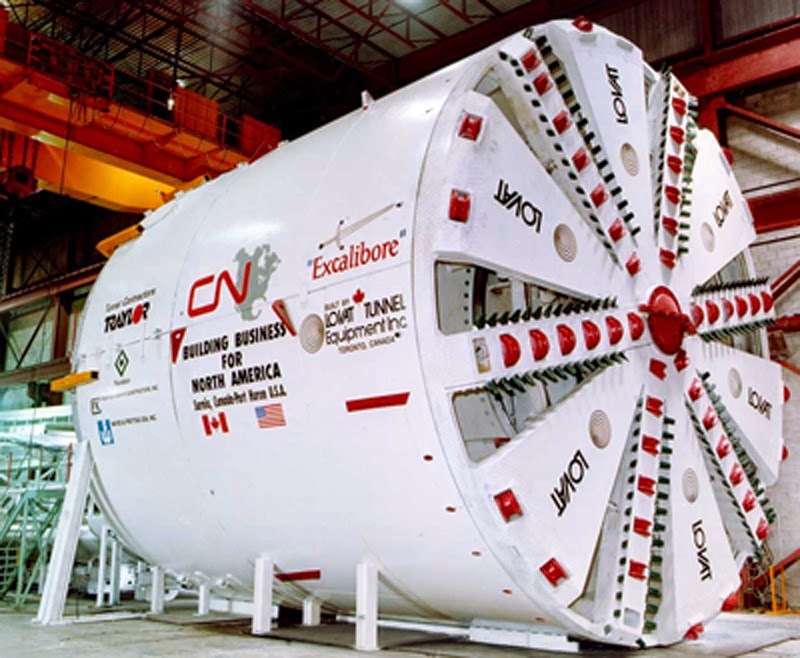 Twin tunnels, more than 11,000 ft (3.35 km) in length, have been completed without a hiccup. Here is a time lapse walk from Montlake (University of Washington "UW" Station) through the tunnel to the Capitol Hill Station. “The two TBMs that are digging from UW to Capitol Hill were named Togo and Balto after famous Huskies - the four-legged kind. "Togo" and "Balto" were canine heroes of a grueling sled dog relay to deliver medicine 674 miles from Anchorage to Nome, Alaska during a diphtheria outbreak in 1925. This amazing journey is commemorated each year with the Iditarod sled dog race. 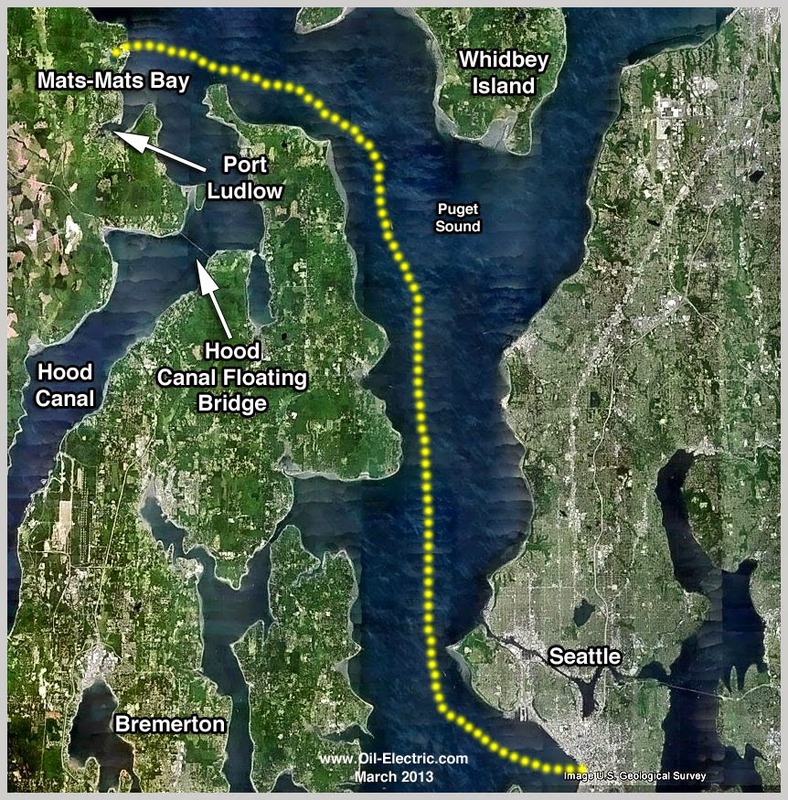 In addition, TBM "Brenda" is boring 4.3 miles north of the University of Washington Station to Northgate Mall. It's a Matter of Time! So here we go again, with the infamous finagling of time launching us into Daylight Saving Time. With a few notable exceptions: Arizona stays with Pacific Standard Time. 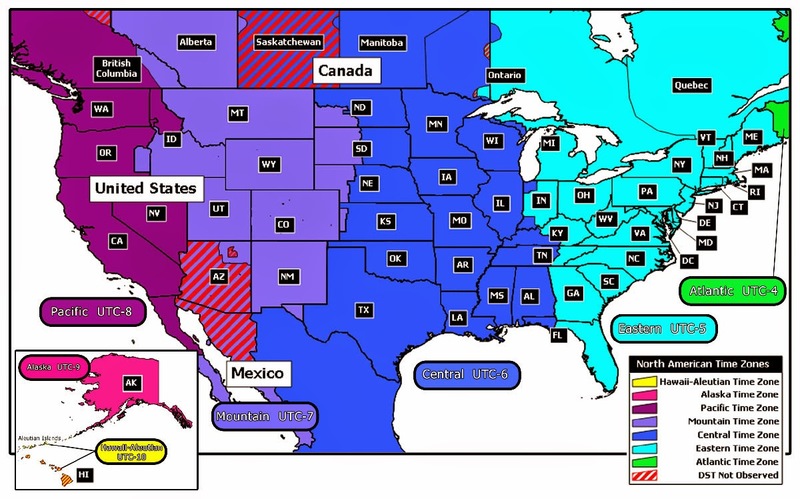 Notice the Navajo Nation in the northeast quarter of the state does observe daylight-saving time. The Hopi Nation, fully surrounded by the Navajo reservation, does not. And Saskatchewan is, well, Saskatchewan. Most of Saskatchewan observes Central Standard Time year round and clocks are not adjusted during Daylight Saving Time. Some exceptions, including the city of Lloydminster, observe the Mountain Time Zone and do observe daylight saving time. • Lloydminster starts Daylight Saving Time on Sunday March 8, 2015 at 2:00 AM local time. • Lloydminster ends Daylight Saving Time on Sunday November 1, 2015 at 2:00 AM local time. Some regions of in British Columbia and Saskatchewan do not use Daylight Saving Time. They include: Charlie Lake, Creston (East Kootenays), Dawson Creek, Fort St. John, and Taylor (all in British Columbia), and most of Saskatchewan (except Creighton and Denare Beach). Pickle Lake, New Osnaburgh, and Atikokan Ontario, remain with Eastern Standard Time throughout the year. Sonora, Mexico, stays with Arizona (since 1998) due to its "economic" ties. 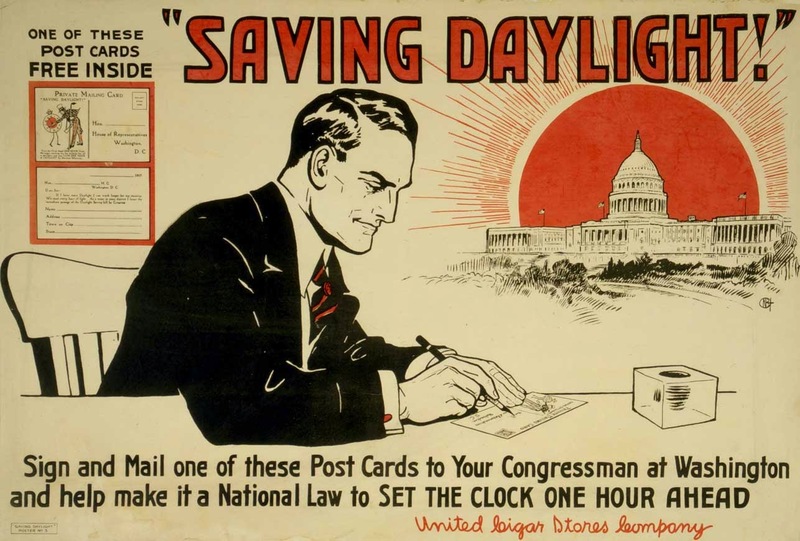 January 1, 2006, Indiana fell into compliance with Daylight Saving Time. Most states participate in daylight savings time. Those employees working the graveyard shift when Daylight Savings Time begins work one hour less because the clocks are set ahead one hour. Those employees working the graveyard shift when Daylight Savings Time ends work an extra hour because the clocks are set back one hour at 2:00 a.m. For example: The scheduled shift starts at 11:00 p.m. and ends at 7:30 a.m. the next day, your employee works an eight- hour shift and receives a 30-minute lunch break. • On the Sunday that Daylight Savings Time starts at 2:00 a.m., the employee does not work the hour from 2:00 a.m. to 3:00 a.m. because at 2:00 a.m. all of the clocks are turned forward to 3:00 a.m. Thus, on this day the employee only worked 7 hours, even though the schedule was for 8 hours. • On the Sunday that Daylight Savings Time ends at 2:00 a.m., the employee works the hour from 1:00 a.m. to 2:00 a.m. twice because at 2:00 a.m. all of the clocks are turned back to 1:00 a.m. Thus, on this day the employee worked 9 hours, even though the schedule only reflected 8 hours. The FLSA requires that employees must be credited with all of the hours actually worked. Therefore, if the employee is in a work situation similar to that described in the above example, he or she worked 7 hours on the day that Daylight Savings Time begins and 9 hours on the day that Daylight Savings Time ends. This assumes, of course, that the employee actually worked the scheduled shift as in our example. The Law alone begins an endless series of hot-air discussions, beginning with the Title of the Law - "Daylight Savings Time." However, given the eclectic collection of nincompoops running the Government, it is no surprise that the Feds misspell the law. Each year, at this time, varying factions of Grammar Police engage in full scale skirmishes over the correctness of "Savings" or "Saving" time. ► Being "Old School" (read "Best School") I'll go with the Associated Press Stylebook and refer to the change in time as "Daylight SAVING Time." Listening to or watching your local news reader will give you a clue as to how serious they are about their profession! ► Even the prestigious "New York Library 'Writer's Guide to Style and Usage'" refers to DST as "Daylight SAVING Time." ► And delivering the final blow, the "Oxford Pocket American Dictionary" states "daylight SAVING time." My first recollection involving the impact of Time Shift came as a young man living in northern British Columbia. My parents were very active in a local church. And I remember looking out the living room window, wondering why one of the church members, dressed in her Sunday Best, was scurrying across our small bridge built over muskeg, to our front door. My Dad, still wrapping a knot in his tie, responded to her frantic knocking, and I heard her say, "But my Dear, they are all waiting in the Church for you!" In my professional career(s), I encountered the time warp several times. 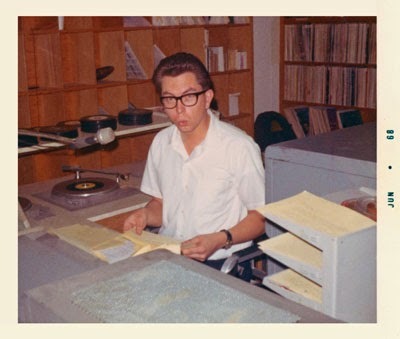 As a radio personality on the 12:00 a.m. to 6 a.m. shift, spinning country-western music to truckers and other isolated souls, I noted the radio Log pages were marked, 12:00 a.m. to 1:00 a.m., 1 a.m. to 2:00 a.m., 2:00 a.m. to 3:00 a.m., 3:00 a.m. to 4:00 a.m., and so on. However, the Page 2:00 a.m. to 3:00 a.m. was marked out with a red ball point "X" with a cursive note from the Traffic Girl; "Switch to Daylight Saving Time. Change station clocks." 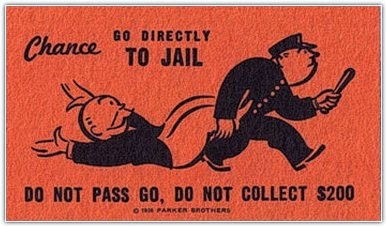 I added a mental note, "Do Not Pass Go - Do not expect a full pay check!" In later years, I worked at a "Doughnut-Hole-In-My-Life" job wherein I prayed I would last long enough to get back the hour they screwed me out of! In our Digital Age, one has to wonder if all the disruption to schedules, transportation, and communication are worth the extra hour of daylight a farmer gains. 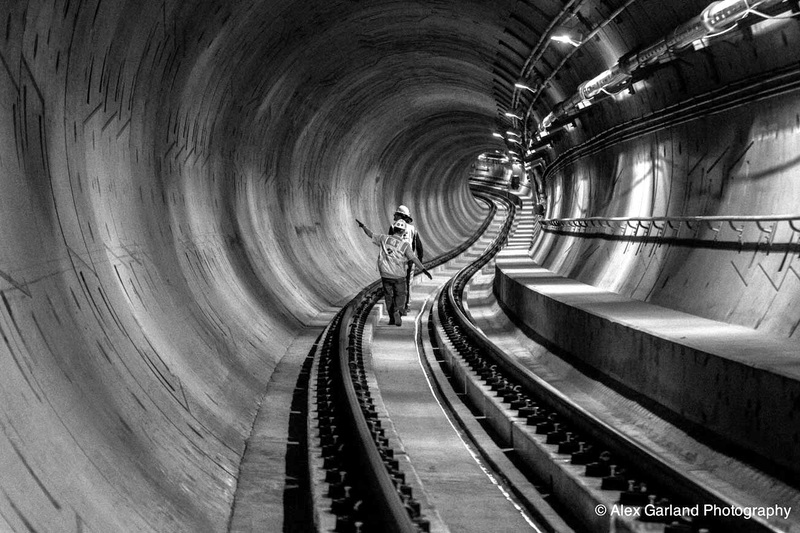 Share with us your experience with the time shift, especially as it affects railroad and other transportation issues.